Summer is all about enjoying the warm weather with family and friends, but even with the long summer days, the season can feel short for many. • Soak wooden skewers for 15 minutes prior to grilling. • Heat grill to medium-high heat. • Remove rind from pineapple and dice into 1-inch pieces. • In small bowl, combine oil, salt and pepper. Add chicken and pineapple; toss to coat. 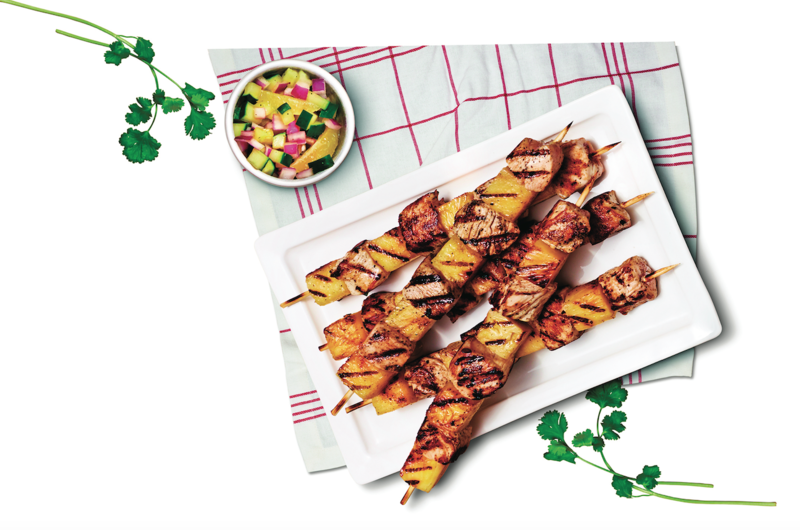 • Alternating chicken and pineapple, pierce onto skewers. • Grill skewers 8 minutes each side, or until chicken is cooked thoroughly. To make Lemon-Cucumber Salsa: In a medium bowl, combine lemon, cucumber, onion, honey, and pepper. Serve lemon-cucumber salsa over cooked chicken skewers. Tip: Supreme citrus fruit by cutting off top and bottom of fruit then cut away peel and pith, leaving no white on outside of the fruit. Slice each segment into wedges by cutting toward a center of fruit along the membrane.